NY Judge dismisses Albert Haynesworth lawsuit. 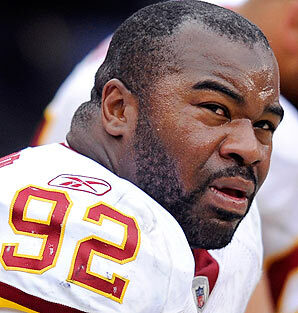 An exotic dancer has lost her bid to sue Washington Redskin Albert Haynesworth for $10 million in New York after claiming he got her pregnant and dumped her. A state Supreme Court judge told Salma Hayek look-alike Silvia Mena her case for emotional distress doesn’t belong here because their “romance” happened in Miami and in Tennessee, where he lives. The baby, Ella, was born nearly two months ago. As many will remember, Mena claimed that she had met Albert Haynesworth in Miami during festivities for Super Bowl XLIV (the most recent one), and that their “romance” continued at Haynesworth’s Tennessee home. After she became pregnant, she alleged that Haynesworth promised to support her financially, only to abandon her thereafter. Mena’s attorney, Sal Strazzullo, indicated that there is already a paternity test filed with the Family Court in New York, because the baby resides there. Haynesworth has been serviced with a notice that he must take this paternity test.